Again, this is me trying. 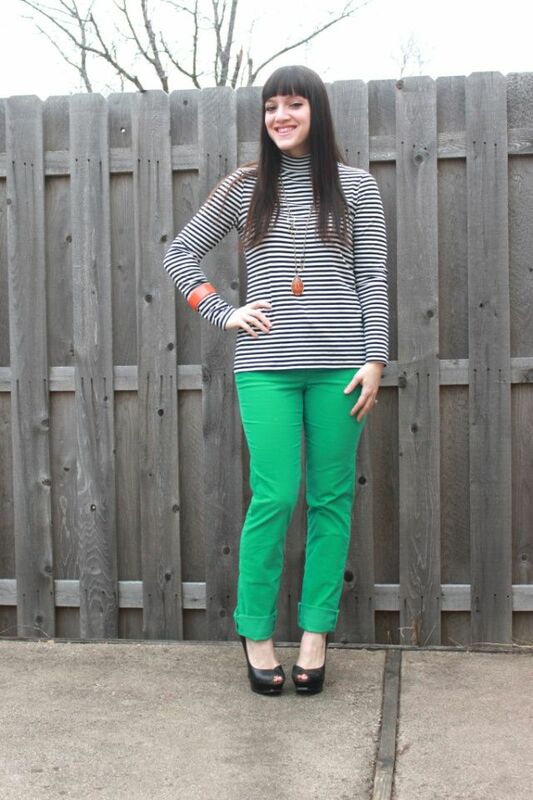 Love the pairing of green with orange and mixed it up a bit with the striped turtleneck. What do you guys think? 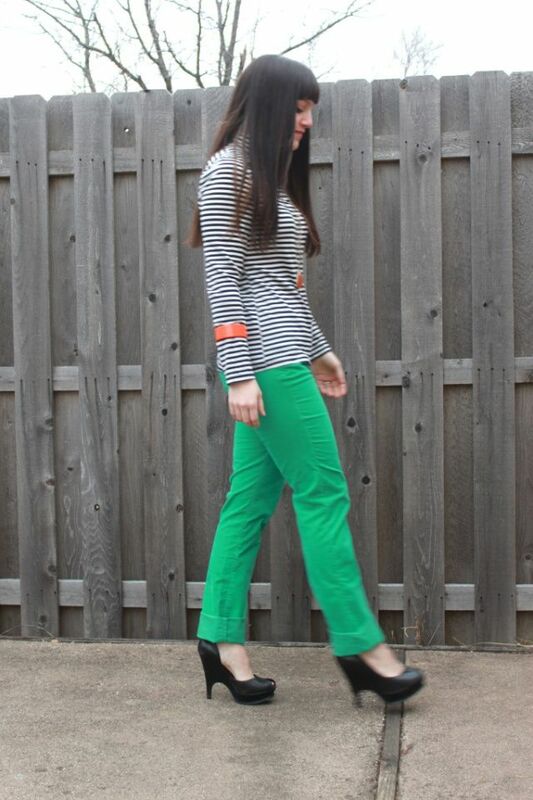 I think it's a good transitioning to spring look as these pants will be worn well into the spring months. Yes, I know it's only February, but I don't think the weather knows what month it is! It's been in the 40's and 50's for over a week now. I'll take it!! 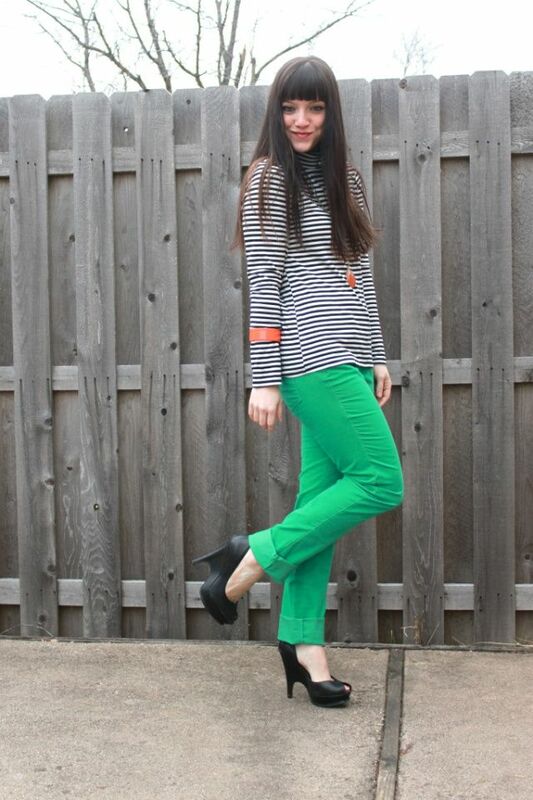 Great mix and great outfit to wear as it gets a little bit warmer! LOVE the green pants. Such a fun color. I think I need to go buy some now, sigh. I posted today about easy, chic outfits for Mommy's (at a reader's request) and since you are one of the most stylish Mommy's I know, let me know your thoughts when you get some time! LOVE them!! I have green jeans too. I would like some coral or light pinks ones. I'm addicted to them. Looks great with the black and white! Ive been tempted to try the color jeans for a while, but unsure on what color to begin with. I love them! I think the shade is better than actual mint anyways. I saw your new picture on Twitter and couldn't wait to check your blog to see more pics. I LOVE THESE PANTS! They look so great on you! 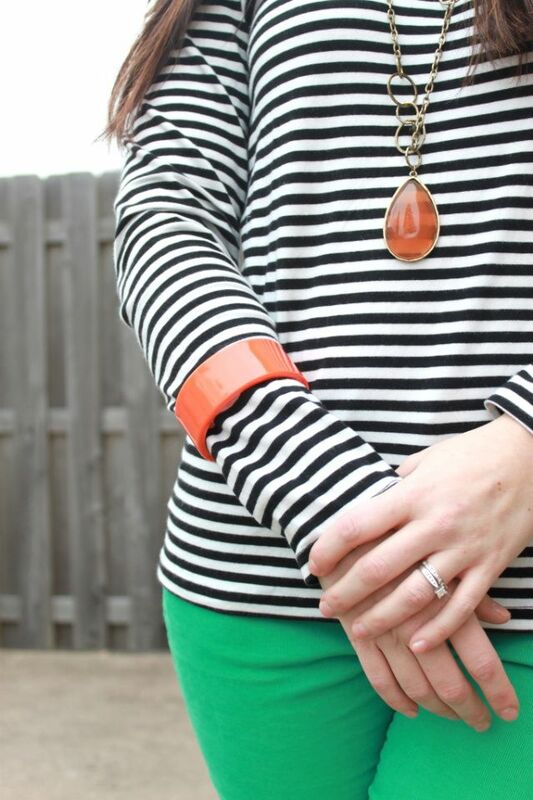 I like the orange accessories paired with them too. LOVE the pants & your hair! Loving the colored denim! Isn't this weather AMAZING! I'm hoping it stays. Thanks again for the shout out and order for t+j Designs. Your the sweetest. I really like the pop of color, and I'm totally jealous of your hair! The pants are so lovely!